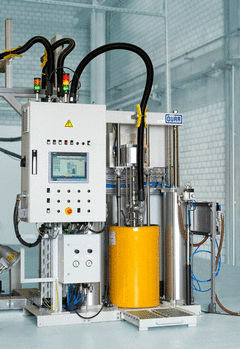 EcoRAM is a material supply system (barrel pump) for Durr-Gluing and Sealing processes. EcoRAMs are available for 20 to 50 liter and for 200 liter barrels. For sealing applications there are also material supply systems for 1000 liter barrels available. In our portfolio we offer various systems such as none heated, heated or temperature balanced to keep the sealant or gluing material within the requested viscosity and on a pumpable level.